The end of the RC season is almost upon us. In our club this realization hits when it’s time to attend the annual Fredonia Fun Fly. 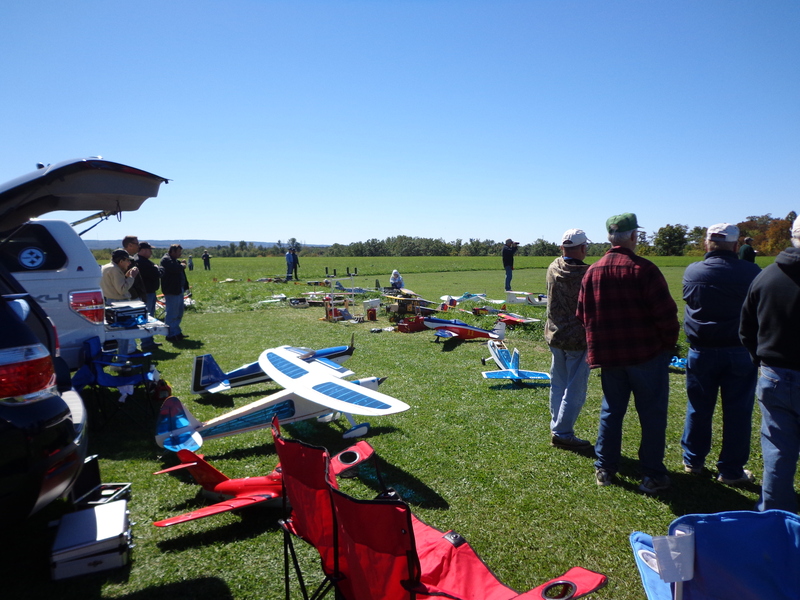 We meet up with a neighboring club and have an afternoon of fun and flying. We were lucky in that the weather was nice and sunny, though a little chilly and windy. It didn’t stop people from flying, though. Things started out a little slow, though. Jay had wanted to get there earlier, but I made him stop at the bank before we got on the road. We were able to find a decent parking spot and he pulled everything out for assembly. 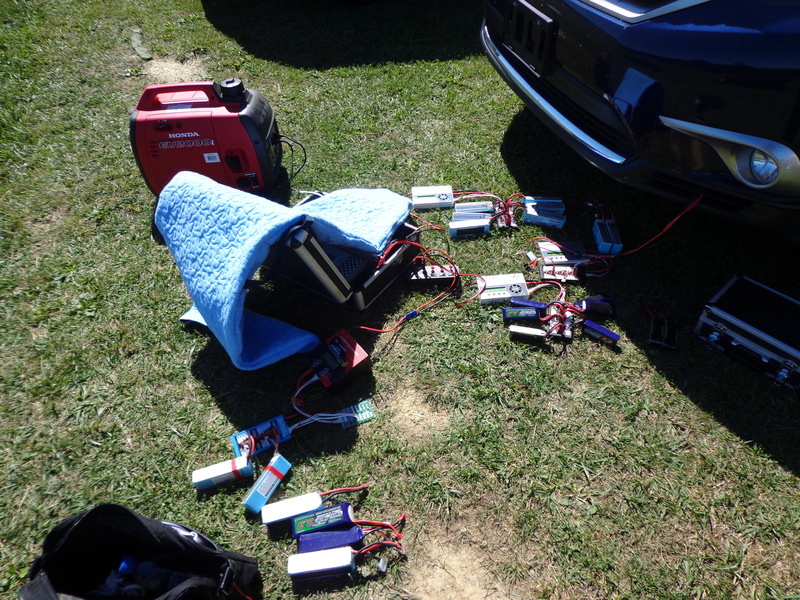 The batteries were put on the chargers and we socialized while waiting. 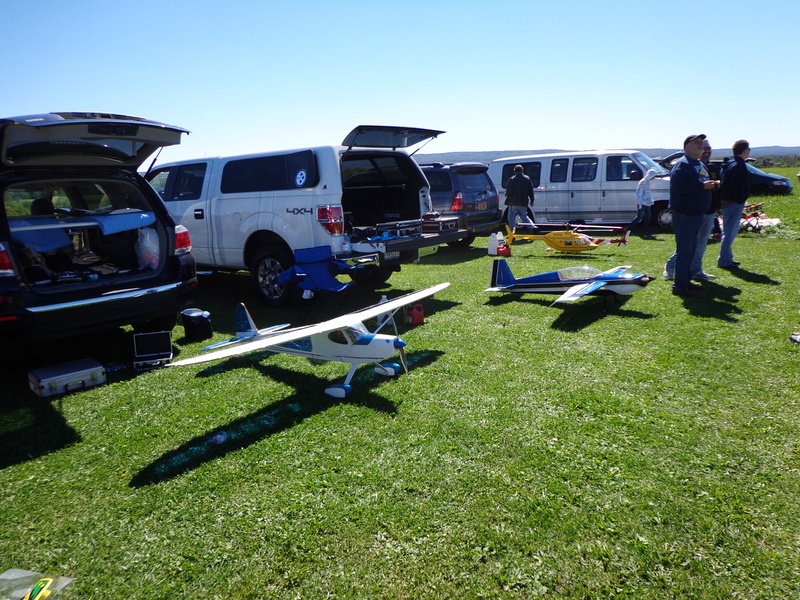 There were a lot of different aircraft there, although most of them were nitro/gas models. Jay had all electric (of course) and there was even a turbine there. This is a gas helicopter that was flown a few times. It’s not a 3D helicopter, though. It was interesting to watch as he flew it around as if it was a scale bird. Do you see the exhaust? As my husband would say, “Electric don’t do that.” Or if it does, then you have a serious problem! 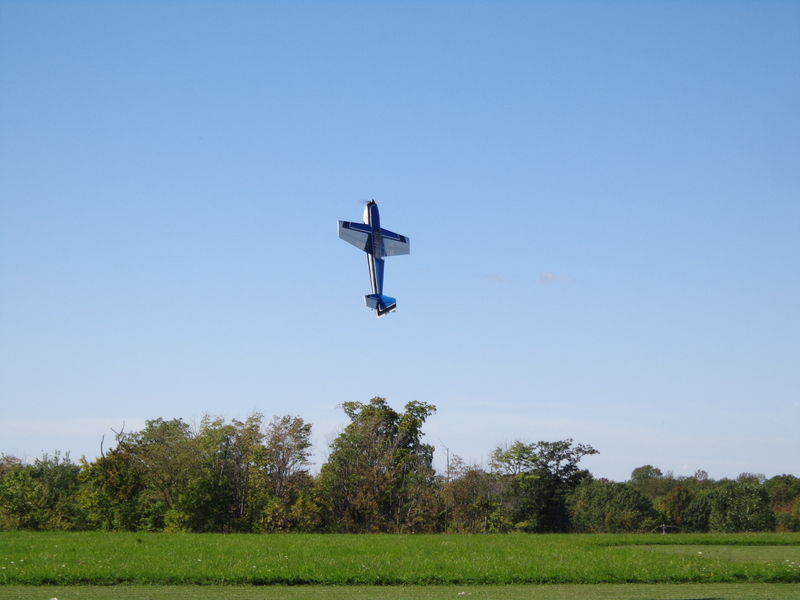 Bill had his electric 3D plane there today. I love watching this one fly. It’s really pretty and seems to so easily go into the various maneuvers. 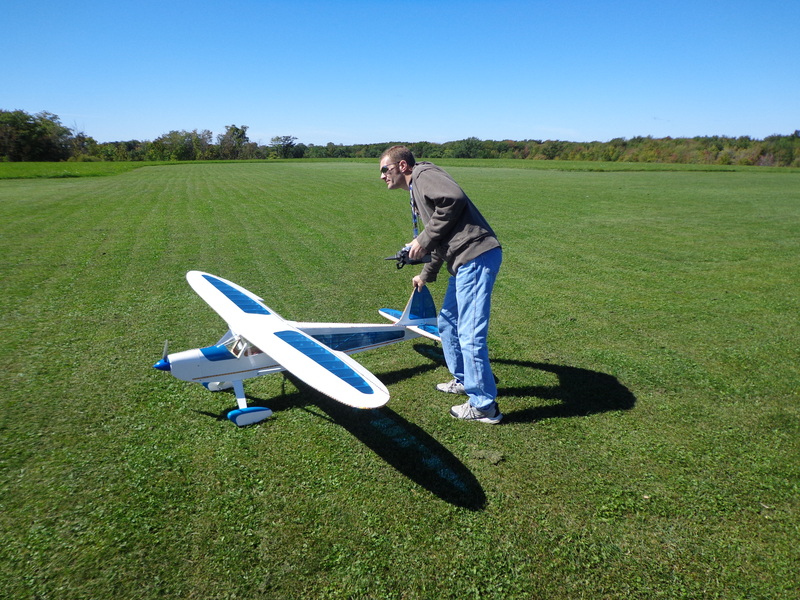 I can’t wait until I get good enough at flying that I can start flying 3D. Isn’t it pretty? It just sits there hovering as if it would happily do it all day. It is such a good natured plane. I love seeing this one in the air. Bill also had his gas Yak on which he had installed a smoke tank. 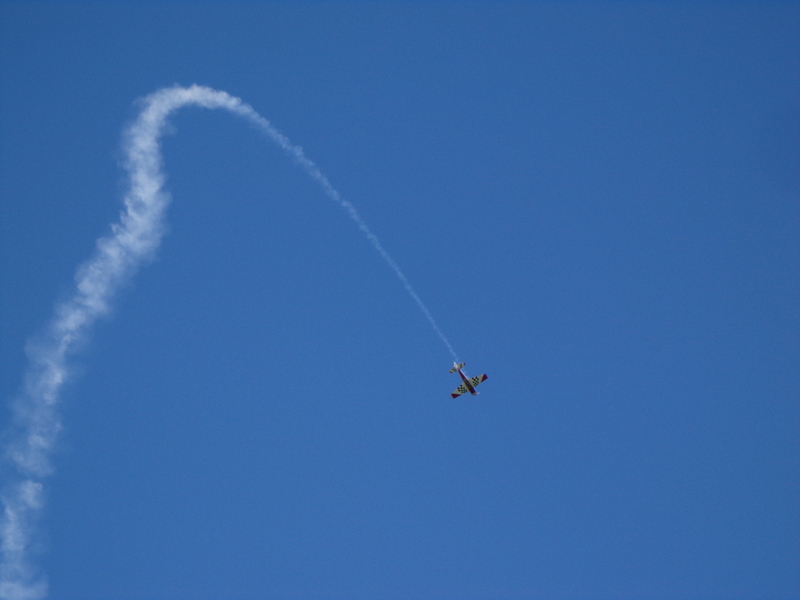 That allows you to put out these really neat smoke trails when you’re flying. 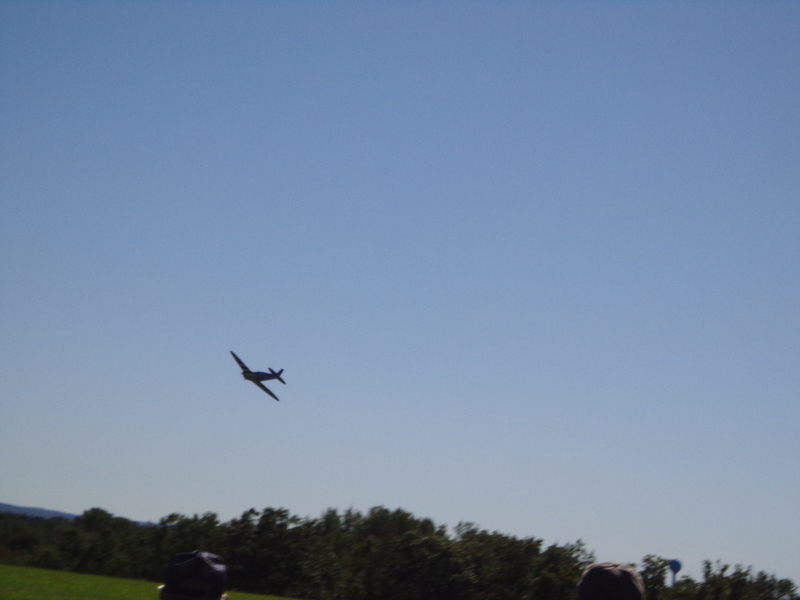 It helps when you’re putting on an airshow so that the spectators can more easily follow you. Also, it just looks really cool. 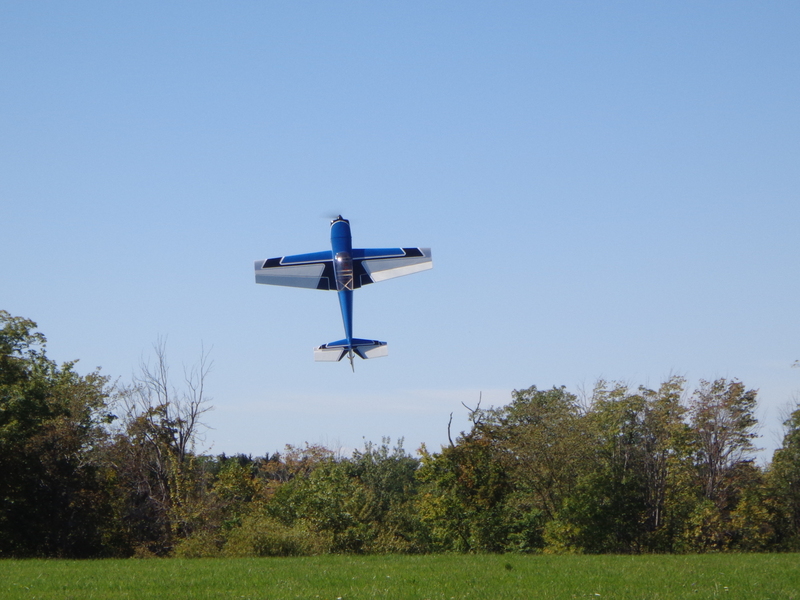 I wasn’t quick enough to get a picture of Bill hovering with the smoke going, but this is a pretty neat picture of the Yak in flight. Jay flew his Rascal, of course. This is currently his favorite plane. And I remembered to take a picture of it during the day! Jay likes to mess around with the Rascal. Here he is coming in for a quick one-wheel touch & go. You can see how he is already starting to angle the plane to get the right wheel down for the ‘touch’ part of the touch & go. 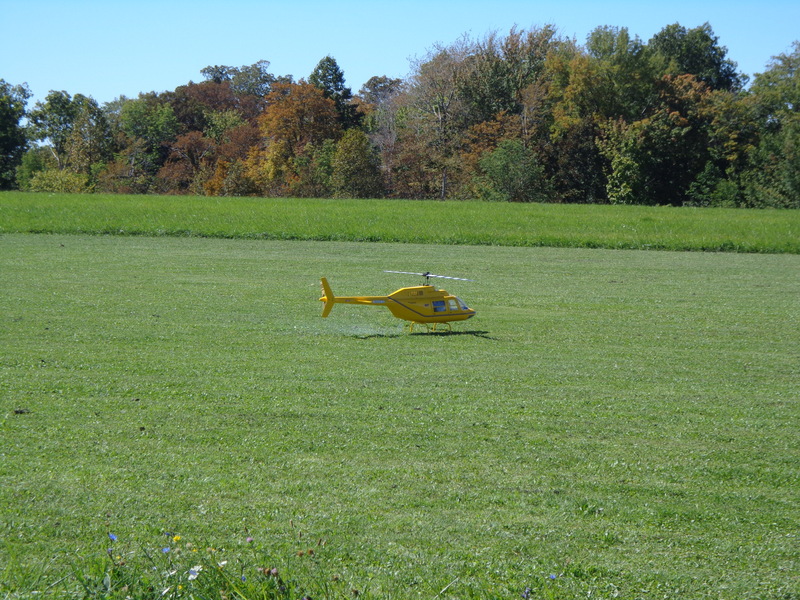 Doug had his electric 600 size helicopter there, too. 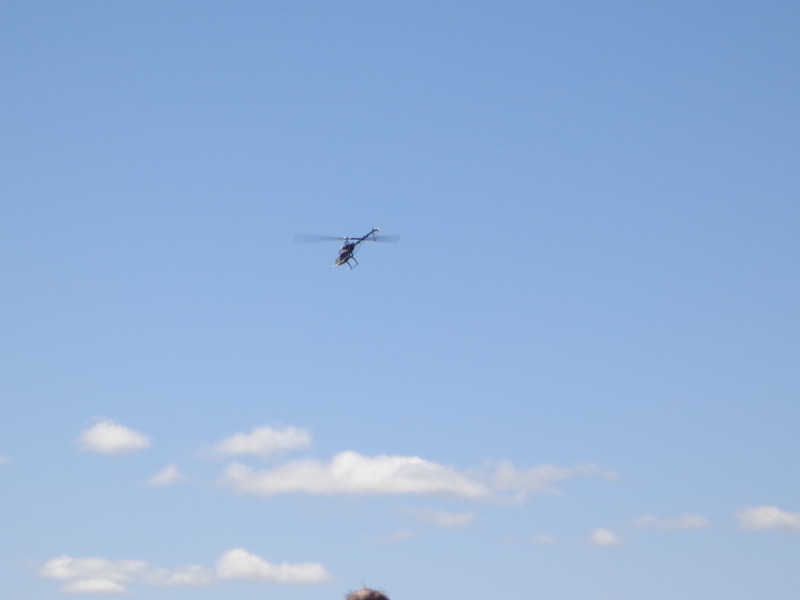 You should see Doug throw down with this heli. He is good at the 3D maneuvers, though he doesn’t think so. We have an event next month that we are going to give a little bit of a demonstration and we’ve already informed him that he will be flying there. We had a couple of mishaps during the day, but nothing really that you could call a major catastrophe. Little things might have broken off here and there, but no big crashes. 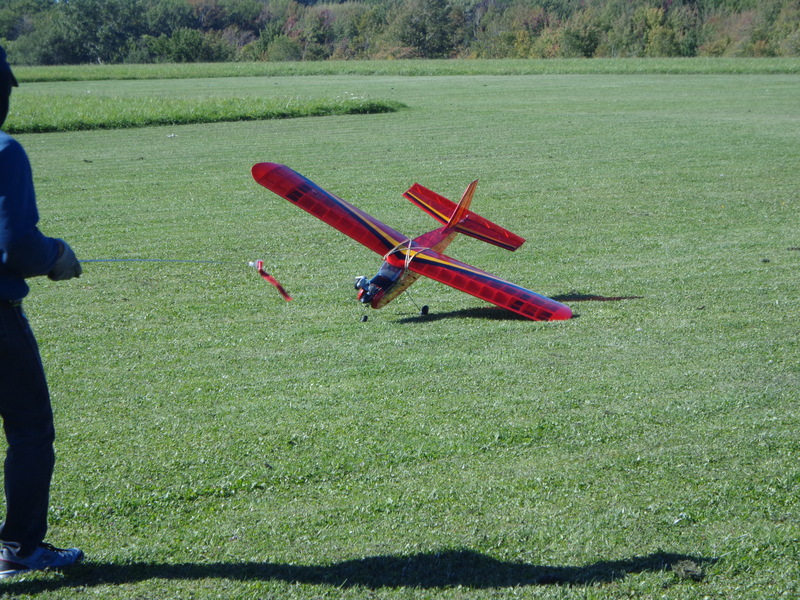 A new prop had to be installed because the crash had broken the old one. 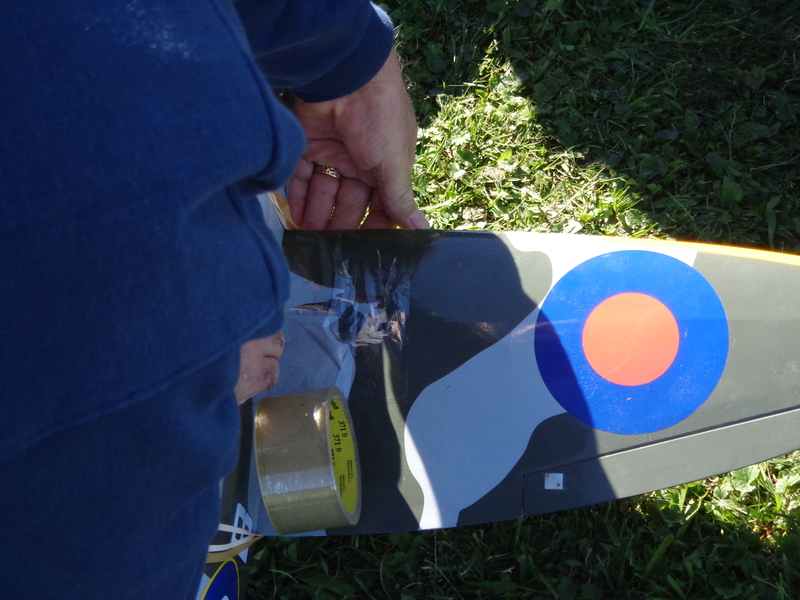 That was quickly switched out, and then the discussion was regarding the battle damage on the wing. Can you see it on the right wing, close to the fuselage? Now do you see it? Yep. How could they fix it so that it wouldn’t compromise the wing or the air wouldn’t tear it apart even more? Packaging tape! That’s the one thing that I’ve learned about this group of guys. If you have a hand full of them at the field they usually have enough material and tools between them to fix most mishaps. 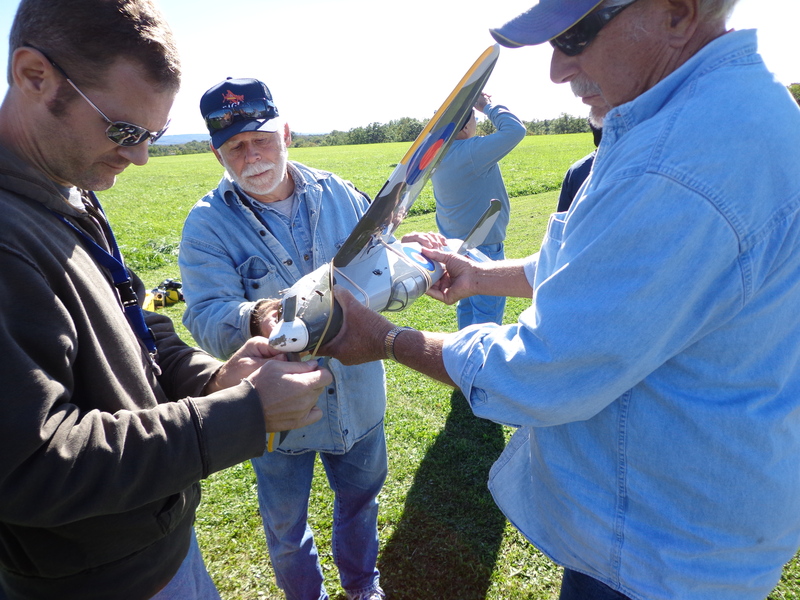 Their goal is to fly and they enjoy helping others to get back in the air. There’s no fun to be had if a guy crashes a plane, has a quick fix, but nothing to actually fix it with right there. Jay carries a good range of things in his case. In fact, I had to loan out some allen wrenches and streamers today. These guys are definitely resourceful. We had one doubting Thomas regarding the rubber bands, but he stood back and watched the activity as the plane was reassembled. 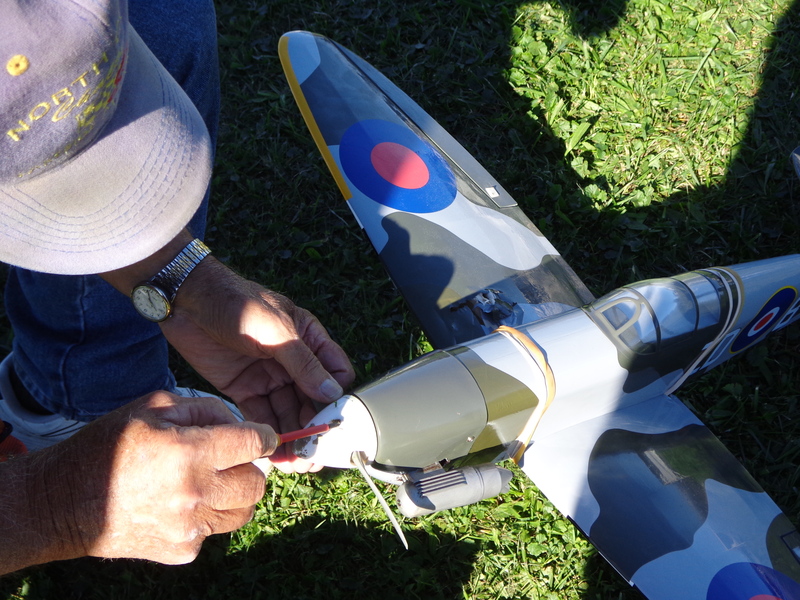 As Jay gets ready to launch the ‘fixed’ plane it was decided that they needed to carry out a good luck ritual. 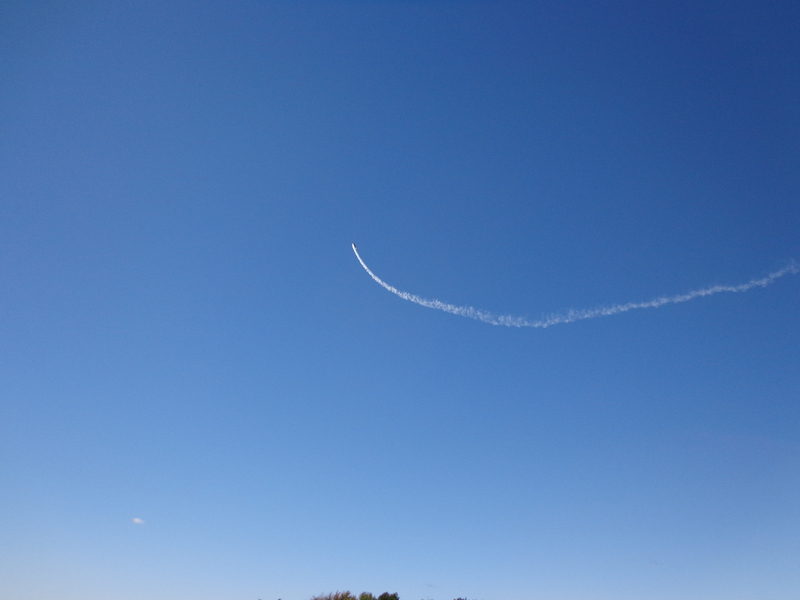 The safety officer went a distance out to double check the field for debris and also to double check the air space. Meanwhile, our VP stood off to the side saluting the safety officer as a sign of respect. 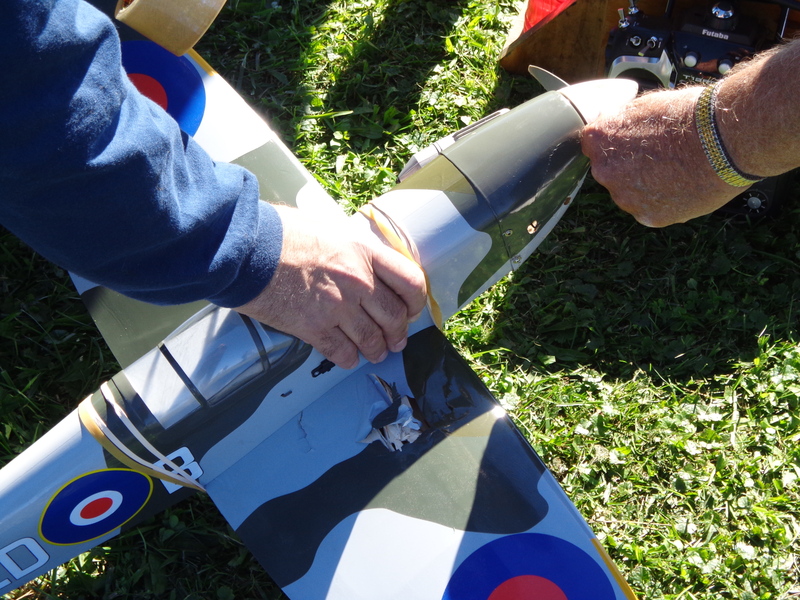 You then have the pilot, Cliff, and the launcher awaiting the thumbs up that everything is okay…. Or maybe I just made that whole thing up and what’s really happening is Cliff is yelling at Al to hurry up and get out of the way so that they can launch this plane, while Adam is shielding his eyes from the sun to see if Al managed to find the parachute that they had dropped from Adam’s plane. Hmm… I like my first story better. It has more color to it. Would Cliff’s plane fly? Or would there be more pieces to pick up this time?? Today was a good day, though, and a lot of fun was had by all. 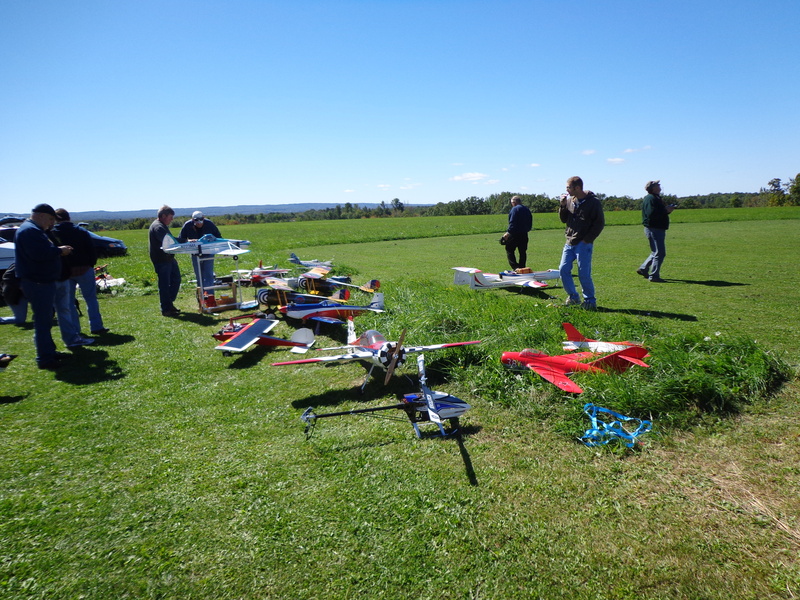 This entry was posted in Fun Fly, Helicopters, Jets, RC Planes and tagged Fun Fly, Helicopters, Jets, Planes, R/C, RC Planes. Bookmark the permalink.